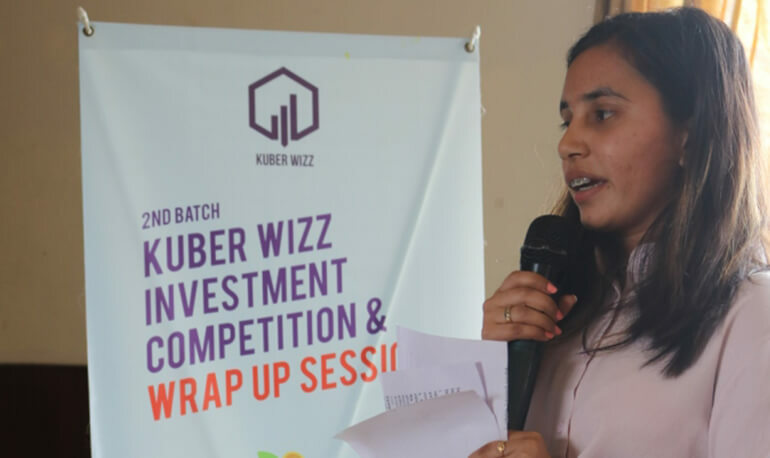 Kuber Wizz “Wrap up Session” was conducted as a formal closing ceremony to mark the end of second Kuber Wizz program (2017-2018). Kuber Wizz participants of second batch Aashutosh Agrawal, Sumiran Giri, and Girish Lakhey shared their experiences of the program. Mr. Radesh Panta, Senior Managing Partner (VROCK and Company) the key note speaker, provided his view on portfolio management and equity investment. Speakers Mr. Suday Kanta Jha, CFA, CEO (Mega Capital Markets Ltd.), and Mr. Hemanta Bashyal, CFA, Managing Director (Bashyal & Company Pvt. Ltd.), delivered their views on valuation and career in finance respectively. Group 5 and group 4, who were able to secure the first and second position respectively, were felicitated by Mr. Radesh Panta with prize of cheques worth Rs. Thirty Thousand and Twenty Thousand respectively. Mr Suday Kanta Jha felicitated Mr Girish Lakhey, Second batch participant, with the appointment letter from GG Investments for being selected as freelance portfolio manager, first time practice in Nepal. And Mr. Hemanta Bashyal felicitated group 5 and group 4 with letter of scholarship of 50% and 25% respectively.